Akatsuki may have discovered why Venus’s atmosphere rotates so fast. The reason may play a vital role in the habitability of Earth-sized exoplanets. As a planet nearly the same size and mass as the Earth, Venus is an essential study for understanding the range of possible conditions on rocky planets. A defining feature of our neighbouring world is a thick atmosphere whose reflective properties enticed ancient astronomers to name the planet after the mythological goddess of beauty, but whose ability to trap heat renders the surface temperature capable of melting lead. Yet perhaps the strangest feature of the Venusian atmosphere is its speed. Winds whip around the planet up to sixty times faster than the surface rotates; a phenomenon known as atmospheric super-rotation. Exceeding 100 m/s (360 km/h) in the upper clouds, wind speeds on Venus are legitimately fast. However, the surface of the planet also rotates extremely slowly. The planet orbits the Sun in 225 Earth days but takes 243 Earth days to rotate on its axis, making the Venusian day (one complete rotation) longer than its year. Such slow rotation may be a common feature among Earth-sized exoplanets such as the TRAPPIST-1 system and Proxima Centauri-b, whose close orbits to their star have likely resulted in tidal lock. 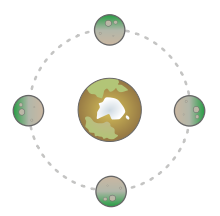 Like the Moon orbiting the Earth, a tidally locked world rotates once per orbit so that one side permanently faces the star while the other experiences perpetual night. Slow rotators with Earth-like atmospheres need to transport heat efficiently around the planet or risk the atmosphere collapsing as it freezes on the cold night side of the world. Such a catastrophic end could be avoided if tidally-locked worlds typically had the fast winds of a super-rotating atmosphere. So what causes Venus’s super-rotation and might it be a common phenomenon? Classically, there are two main pictures for Venus’s super-rotation. In the first scenario, frictional drag of the atmosphere over the planet surface results in slowing down the planet’s rotation to accelerate the winds (the Gierasch-Rossow-Williams mechanism). In the second scenario, the winds are excited due to heating from the Sun (known as solar thermal tides). Models of the first “surface-up” mechanism are notoriously sensitive to the exact starting conditions on the planet. Modest shifts to the temperature distribution of the planet may kill or initiate super-rotation. This would suggest that relatively few slowly rotating worlds would end up with atmosphere-preserving super-rotating winds, as conditions on the planet would need to be just right. But super-rotation on Venus has been observed both at the cloud tops and down to depths of tens of kilometres. Given that Venus reflects a large fraction of the incident sunlight, could the influence of the Sun really be driving the super-rotation of the middle layers? Artist illustration of the Akatsuki Venus Climate Orbiter approaching Venus. Differentiating between these two options is what Akatsuki has been investigating. 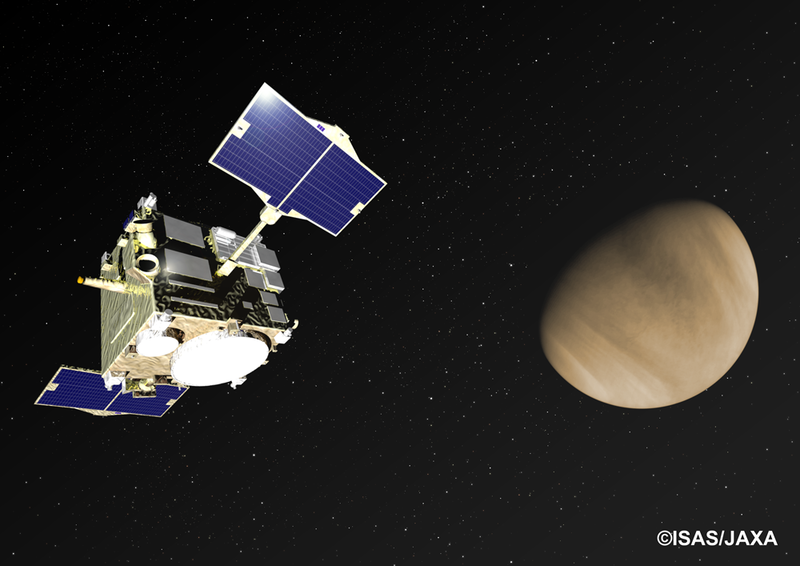 The Akatsuki spacecraft (meaning “Dawn” in Japanese) entered Venus’s orbit on 7th December, 2015. It was on the third anniversary of the orbit insertion that a press conference was held in Tokyo to discuss the latest results. 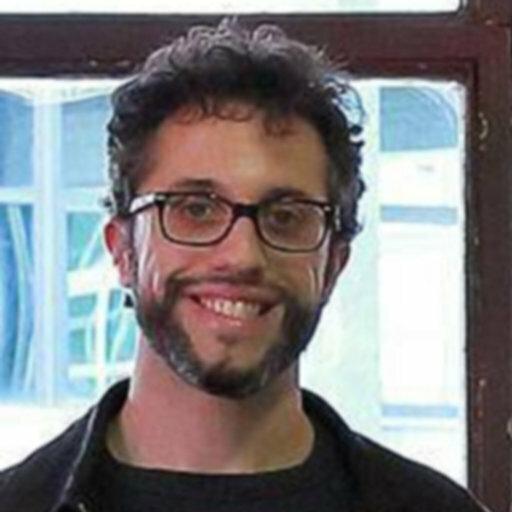 Led by International Top Young Fellow (JAXA’s prestigious postdoctoral fellowship program), Dr. Javier Peralta, the press conference presented results from a new paper published in the Astrophysical Journal Supplement Series in December. Dr Javier Peralta, ITYF at ISAS/JAXA and lead author of this work. In this paper, Peralta used 466 images of the Venusian clouds captured by the IR2 camera on Akatsuki at an infrared wavelength of 2.26 microns between March and November 2016. 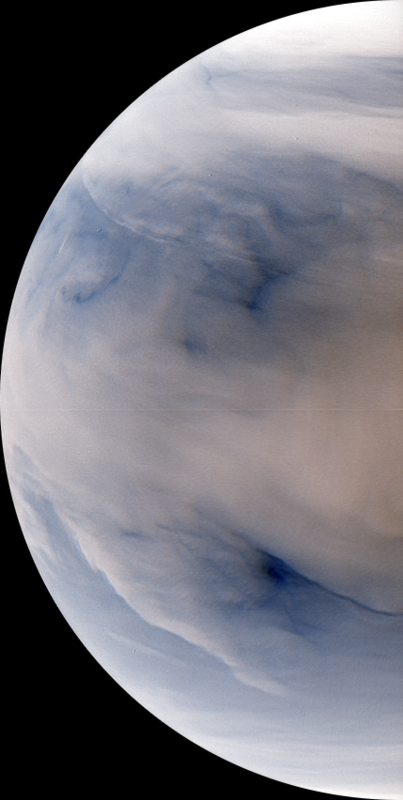 By comparing images taken at different times, Peralta was able to track clouds as they swept around the Venusian globe to measure their speed. On the Venusian dayside, the atmosphere is illuminated by the incoming sunlight. This is strongly reflected in both ultraviolet and infrared wavelengths by the upper cloud at an altitude of 60 – 70 km above the planet surface. However, the nightside illumination comes from infrared heat emanating from Venus’s hot surface. This is partially blocked by clouds deeper in the atmosphere at altitudes between 48 – 60 km. As the clouds have varying transparency to this infrared glow, their shapes become visible when viewed through Akatsuki’s IR2 camera. It was these deeper, nightside clouds that Peralta tracked. Peralta’s cloud tracking algorithm was semi-automatic, utilising both humans and computers. Clouds were identified by hand and then mapped a later image using computer code and the result confirmed by hand once again. The result was 2,947 wind measurements which revealed an interesting pattern. There was a clear acceleration of the clouds that was tied to the location of the Sun, strongly implying that the Sun was having an effect on clouds far below the upper atmosphere. 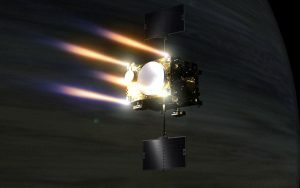 Peralta hopes that combined results from Akatsuki and the European Space Agency’s Venus Express might reveal even more about this system. 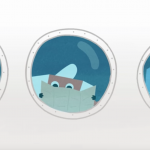 Animations, images and the wind measurements made in the Peralta’s paper are available to download and be explored by the community. Peralta next looked beyond the Akatsuki data, comparing results from previous Venus missions stretching back to 1978. While it is challenging to compare results from instruments on different spacecraft and ground-based telescopes, Peralta’s results implied that the speeds of Venus’s winds have shifted over the last thirty years. Such a discovery is not only consistent with a solar driver but may be suggestive of the first detection of climate change on another planet. “If solar tides drive the super-rotating winds, this may imply that the cloud albedo (how reflective the clouds are) may have changed over time and affected the impact of the solar radiation,” Peralta explains. Such a result is good news for tidally locked worlds. If Venus’s super-rotating winds can be driven by the Sun, then maybe such rapid circulation could be common on slow rotating but potentially more temperate worlds around other stars. While the weather beneath a super-rotating atmosphere would be very different from that on Earth, it might allow the planet to retain its atmosphere and even the desired surface conditions for life. By comparing the two Earth-sized planets in our own Solar System, we may learn much more about what it takes to be a habitable world.